The Liberty Process LL10H Progressive Cavity Pump represents an ideal investment for heavy-duty treatment pumping applications like industrial wastewater pumping and sewage removal and effluent flow control in the wastewater process. The LL10H is an optimal choice for the wastewater industry with its ability to handle biosolids and waste effluent with high solids content. The LL10H’s flow rate is (27 gallons/100 revolutions) from 22 GPM up to 140 GPM and is a standard flanged pump design manufactured with high strength cast iron or 316 stainless steel pump casings and designed in 1, 2, and 3 stages for 75, 150 or 225 psi discharge pressures. 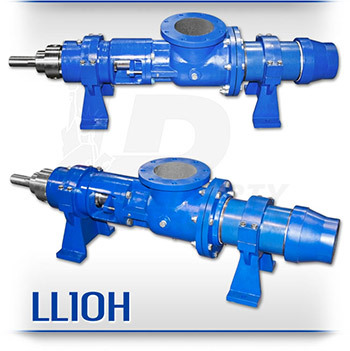 LL10H pump parts are direct drop-in aftermarket replacements that are dimensionally interchangeable with the *Moyno® L10H Series, *Tarby® TL10H Series and *Continental® CL10H Series* and have been in use in wastewater pumping facilities throughout North America now for over a decade. The LL10H is a modular design with simple hardened pinned joint drive assembly. The LL10H Rotors are typically hardened tool steel or 316 stainless steel with a hard chrome plating for long life in abrasive pumping applications. All other wetted parts are either carbon steel or 316 stainless steel. Stators are available in many elastomer materials such as buna, natural rubber, epdm and viton. The standard seal design is a set of packing with a Lantern Ring and flush connectors. Mechanical seal options are readily available. In the field of wastewater transfer and wastewater processing, the LL10H is a widely accepted unit both for its pumping capability with biosolids and for its durability in the wastewater process.